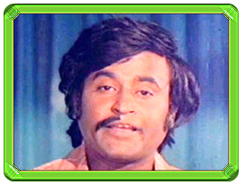 Rajinikanth Film Review From Thillu Mullu. Thillu Mullu Movie. Rajini Film Thillu Mullu. Rajinikanth Thillu Mullu movie. www.rajinikanth.com. The movie starts with the song thillu mullu thillu ullam ellam...!The story is about a talented youngster who is none other than our thanga thalaivar super star Rajnikanth. The hero wants to enjoy life with his friends like our lollu boys. But those are the days when the Bosses used to be very strict and they expect employees to be very much disciplined. After completing his studies he is forced to take up a job as the family situation demands, it is the conventional Tamil Cinema centiment vayasukku vandha thangachi and fortunately vayasana amma and the brothers are missing in this movie. One of his family friends "Poornam" Viswanathan tells him about a opening in a company like Sun/Cisco/Microsoft owned by "Thengai" Srinivasan and he also tells him the expectation of the owner. Rajnikanth pretends to meet expection of the Boss by giving fake certificates that he knows C++,Java, Oracle, Corba,Blue tooth and what not. He gets the job. The real story starts when Thengai sees Rajinikanth in a football match. The trouble starts because Rajini asks his friend to make a phone call saying that his(Rajini's) sister is sick but that guy sodhapifies it saying mother is sick. And from that point Rajini claims that he has a brother who is good for nothing etc and builds a story on that. Then Thengai offers a job of a music teacher to his daugher for the fictious character for which Rajini has to shave off his mouche. And atlast because of a servant boy thengai comes to know the truth and starts chasing Rajini for cheating him and as usual the story ends with a subam and thengai accepts to give his daughter to Rajini.